For those of you living in London, UK, the first of MDI’s upcoming three debates, will be this Monday, at the London Muslim Centre (East London Mosque), at 6:00pm (6:15pm start – sharp). Brother Zakir Hussain, debates seasoned American Christian scholar, Dr James White on the fascinating and evocative topic: Is Muhammed (saaw) in the Bible? Attendance is free, and open to all. May Allah make the truth shines forth through this historic debate. Amen. Br Zakir Hussain lost, really? It was Jw who are unable to deal with lots of br Hussain’s arguments. Or maybe because of his age but JW was no match to the level of research br Hussain did for this topic. When did Zakir say “he was all over the place”? At the 1:01:47 point in the debate Zakir admitted “I’m going to be a little all over the place . . . “. I have heard the debate, so not just believing the review, and as for the rest of the debates, his opponents lost it badly, including shabbir ally who was humiliated due to his dishonesty and inconsistency, and if you think the debate with abdullah kunde was a victory then its a big joke. None of his opponents lost , it was James White who lost very very badly , open your sleeping eyes and deluded brain to see properly . Shabbir Ally was as usual brilliant and scholarly in his debate with James , it was James who was not. Coming on to debate with Abdullah , James White was absolutely beaten , Abdullah was having top class rational arguments and James White was as usual speaking with out even thinking what he was speaking and contradicting himself frequently. 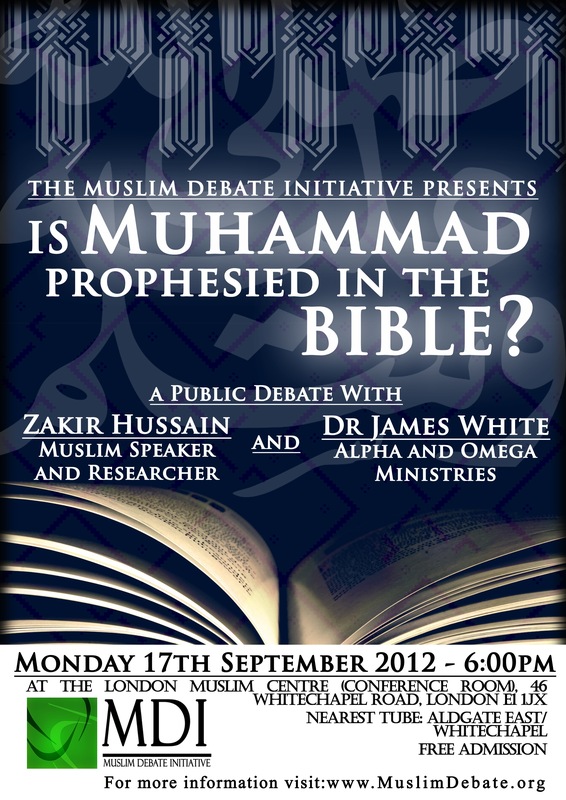 Coming on to this debate James White was no match to the research and arguments which Zakir brought . Without doubt, if one hears the debate, Zakir did well masha’Allah, and James White was no match. Just see how many times White misquoted and was exposed by Zakir! And White ignored many of the important points that Zakir made. Plus White was no match and showed lack of consistency, when Zakir made the right point that the Christians claim many prophecies for Jesus in the OT, yet they’re no where as clear as the Prophecies about Prophet Muhammed (Sallallahu alaihi wa sallam) in the Bible. Even White admitted that Zakir did his homework. As for being “all over the place”, Zakir did say that in his rebuttal stage, because he had to answer many of the points of White, because White was “all over the place”. So be fair. Its not like Zakir didn’t say “I won’t be all over the place”. But even then, Zakir did well and I think it was right he countered many of White’s arguments, instead of just being “in one place”, a tactic of White. Can someone give a link where I can watch it? Again we will appreciate it if any one of the muslim audience recorded the video for it to be published. The last debate between Sami Zaatari and David Wood in the US was left to be recorded by David wood who edited the embarrassing part he suffered and posted the rest. Thank you very much for the work you are doing. We pray for you in all your endeavors. Please could you direct us to the debate between Sami Zaatari and David Wood in the US title “Is Mohammad a good role model to society”(I mean the one which was recorded by MDI or a muslim because there is no questions and answers to the David Woods recordings which is linked at this site. Again we will appreciate if a muslim video recording of Naik Hussain and James White is published so that it will serve as an educational and reference material for all. If we leave the recordings of these historic debates to christians like David Wood, for sure they will edit it and destroy its intergrity. Poor review of the debate, zakir was no match for Dr white, he came nowhere close to the topic. Great Job by Abdullah Al Andalusi. He just posted the historic debate between Naik Hussain and James White. I will record it for educational purposes. I’m going to be listening to the debate soon. I have benefited much from Dr. James White and have listened to many of his debates on different topics. I simply want to say to the commenters above, who are saying that Dr. White lost, that such talk is uninformative, because you guys are not discussing the any of the points from the debate. As encouragement for further dialogue with Christians like me, on your part, I would suggest you spoke more about the arguments presented and pontificate less about who won. Blessings. To be fair, both Christians and Muslims are hearing trying to ‘count up the points’ for who won the debate. While I agree that we should have a more mature discussion, we must first admit that neither Islam nor Christianity have a monopoly on immature, biased and prejudiced followers.